© Kobayashi et al. ; Licensee Bentham Open. Excessive pelvic tilt may be one of the factors leading to instability in total hip arthroplasty (THA), even when the acetabular cup is placed properly. To our knowledge, only a few studies have described late anterior dislocation due to posterior pelvic tilt. We present 3 cases with late anterior dislocations possibly due to posterior pelvic tilt. Case-1: An 84-years-old woman fell and presented with an anterior dislocation 12-years after THA. Her pelvis had tilted to approximately 30° posteriorly in a supine position. After conservative treatment, she presented with 10 recurrent anterior dislocations. She had thoracolumbar kyphosis due to multiple compression fractures. Revision with anterior placement of an elevated liner and a 32-mm head corrected the dislocation, and no further dislocations occurred. Case-2: A 78-years-old woman fell and presented with an anterior dislocation 4-years after THA. Her posterior pelvic tilt had increased 23° due to a lumbar compression fracture. Revision by decreasing the cup anteversion was performed, but recurrent posterior dislocations occurred. Owing to her worsened general condition, further treatment was abandoned. Case-3: A 79-years-old woman twisted her body and presented an anterior dislocation 3-years after THA. After manual reduction and conservative treatment, the dislocation recurred. Her posterior pelvic tilt had increased 16°. Although minor trauma triggered the anterior instability in these patients, the underlying pathomechanism existed in the progressive pelvic posterior tilt due to thoracolumbar kyphosis. As longer life expectancy as well as implant survivorship is predicted, attention must be paid to the change of pelvic tilt in elderly patients. Keywords: Anterior dislocation, Compression fractures, Late dislocation, Lumbar kyphosis, Posterior pelvic tilt, Total hip arthroplasty. however, anterior dislocations account for approximately 20% of all dislocations [4-6]. The factors that affect dislocation risk include patient characteristics, implant design, and variations in surgical techniques [7-9]. Of these factors, 13% to 30% of dislocations are reportedly caused by implant malpositioning [10, 11]. During THA, surgeons determine where to place the acetabular cup using bony landmarks of the pelvis or planes, such as the anterior pelvic plane (APP), which is formed by the anterior superior iliac spines and the pubic symphysis, for reference [12-15]. However, because the sagittal pelvic tilt can change the version of the cup relative to the stem, any excessive pelvic tilt may lead to subsequent implant malpositioning and dislocation. Previous studies have described large inter-individual variations in pelvic tilt ranging from 20 degrees posteriorly to 20 degrees anteriorly [13, 16]. Other intra-individual variations have also been reported; for example, decreased lumbar lordosis with aging has been shown to result in an increase in posterior pelvic tilt among elderly individuals . Likewise, a high incidence of posterior pelvic tilt has been reported in patients with advanced-stage ankylosing spondylitis [18, 19]. In cases involving posterior pelvic tilt, anterior dislocation is a concern after THA because the tilting is thought to be accompanied by increased anteversion of the cup. To our knowledge, only a few studies have described late anterior dislocation due to posterior pelvic tilt . Here, we present 3 cases with recurrent anterior dislocations caused by minor trauma occurring more than 2 years after THA. We report that the recurrent dislocations appeared to be caused by aging and posterior pelvic tilt. A 72-year-old woman presented with osteoarthritis in her left hip and underwent cementless THA (AMS and PerFix, 46 mm Cup, elevated liner, 22 mm zirconia, Kyocera, Japan). The cup inclination was measured as an abduction angle using the interteardrop line as the baseline. The cup anteversion was calculated using trigonometric function from anteroposterior radiographs following the method of Lewinnek et al. . Cup anteversion was 16.1 degrees and cup inclination was 37.3 degrees. No joint instability was observed during surgery. There were no complications after surgery. The woman fell 12 years after the surgery (when she was 84 years old) and presented with an anterior dislocation of the left hip joint (Fig. 1). Manual reduction and conservative treatment with a brace were performed. However, after treatment, she presented with 10 recurrent anterior dislocations. Fig. (1). An 84-year-old woman (Case 1) fell and presented a dislocation 12 years after THA. Anteroposterior (A) and lateral (B) radiographs showed an anterior dislocation. We quantified the changes in pelvic tilt on the sagittal plane using the aspect ratio of the obturator foramen (OF) on anteroposterior pelvic radiographs [22-25] (Fig. 2A). The ratio increased from 1.0 to 1.43 at 12 years after the primary THA, and the pelvis was tilted approximately 30 degrees posteriorly when measured with the patient in a supine position. When measured in a standing position, the pelvis was found to have tilted an additional 13 degrees posteriorly compared to the supine position. Osteoporotic changes were observed in the thoracolumbar spine. Prior compression fractures were also observed in T10, T11, and L1, and the spine showed significant kyphosis. Cup anteversion in the standing position measured from anteroposterior radiograph increased to 48 degrees. Lateral views of the pelvis in the standing position revealed that the APP was tilted 46 degrees posteriorly against the floor and that the anterior opening angle of the acetabular cup was 57 degrees (Figs. 2B and C). Owing to systemic complications, revision of the acetabular cup was not performed. A 15-degree elevated liner was placed in the anterior direction and a 32-mm enlarged femoral head was revised. No dislocations occurred after this procedure. Fig. (2). Case 1 (A) Pelvic tilt on the sagittal plane was quantified using the aspect ratio of the obturator foramen (H/W) on anteroposterior pelvic radiograph. (B) The pelvis on the standing position. H/W increased from 1.2 to 2.2, suggesting a posterior pelvic tilt of 43 degrees. (C) Severe thoracolumbar kyphosis (dotted line) is present due to multiple compression fractures. H: height the obturator foramen. W: width of the obturator foramen. A 74-year-old woman presented with rheumatoid arthritis and underwent THA (AMS and PerFix, 48 mm Cup, elevated liner, 22 mm zirconia, Kyocera, Japan) (Fig. 3A). Cup anteversion was 15.6 degrees and cup inclination was 47.1 degrees. No joint instability was observed during surgery. When she was 76 years old, L3/4 posterior lumbar interbody fusion was performed for lumbar spinal canal stenosis. After this procedure, she had a compression fracture of the first lumbar vertebra. Two years later (when the woman was 78 years old), she fell and presented with an anterior dislocation of the left hip joint. Manual reduction and conservative treatment with a brace were performed. However, she presented with recurrent anterior dislocations. Her pelvis was tilted 23 degrees posteriorly in the supine position 4 years after surgery compared to that observed immediately after surgery. When measured in the standing position, the pelvis was found to have tilted an additional 7 degrees posteriorly and cup anteversion measured from anteroposterior radiograph increased to 48 degrees (Fig. 3B). Owing to the compression fracture of the first lumbar vertebra, the thoracic and lumbar vertebrae displayed a convex curvature. The lateral view of the pelvis in the standing position revealed that the APP was tilted 30 degrees posteriorly against the floor, and the anterior opening of the acetabular cup was 57 degrees (Fig. 3C). When revision THA was performed, the anterior opening angle of the acetabular component decreased. However, she started to have recurrent posterior dislocations. Because the general condition of the patient worsened, further treatment was abandoned. Fig. (3). Case 2 (A) A 78-year-old woman fell and presented with an anterior dislocation 4 years after THA. (B) Her pelvis in the standing position gained 23 degrees posterior tilt due to a lumbar compression fracture. (C) The lateral view of the spine in the standing position revealed thoracolumbar kyphosis (dotted line) due to an L1 compression fracture (*) and that the anterior opening of the acetabular cup was 57 degrees. A 76-year-old woman presented with osteoarthritis of her left hip and underwent THA (AMS and PerFix, 48 mm Cup, elevated liner, 22 mm zirconia, Kyocera, Japan). Cup anteversion was 16 degrees and cup inclination was 46.5 degrees. No joint instability was observed during surgery. Three years after surgery (when she was 79 years old), she presented with an anterior dislocation of her left hip when she turned to the right while in an upright position. The dislocation was manually reduced, and conservative treatment with a brace was performed. However, she again presented with an anterior dislocation. In comparison to when the patient first underwent surgery, the pelvis was tilted 16 degrees posteriorly in the supine position. Cup anteversion in the supine position measured from anteroposterior radiograph increased to 48 degrees when the dislocation occurred. We have described 3 cases who presented with recurrent anterior dislocations caused by minimal trauma several years after THA. All the patients were elderly women, and in all cases, the pelvis was greatly tilted posteriorly. As seen in cases 1 and 2, kyphosis can result from aging and compression fractures, and is considered a cause of anterior dislocation. Aging generally results in posterior pelvic tilt because elderly patients are prone to compression fractures and lumbar spondylolisthesis. All the patients reported here were elderly women and had significant posterior pelvic tilt, especially in standing position. Sato et al. reported that more than 20 degrees of posterior pelvic tilt may cause anterior instability and diminish the optimal range of cup version . Tamura et al. reported that the presence of thoracolumbar compression fractures, lumbar spondylolisthesis, and posterior tilt of the first sacral vertebra could result in greater increase of the posterior pelvic tilt between the supine and standing positions . Shon et al. suggested the placement of an acetabular cup in cases with kyphosis. They reported a case with multiple anterior dislocations occurring 3 months after THA . This case showed decreased sacral tilt by 33 degrees from the supine to the standing position and increased anteversion of acetabular cup by 35 degrees. In Cases 1 and 2 presented here, compression fractures in the vertebrae were observed. They had increased posterior pelvic tilt compared to that observed immediately after surgery in the supine position, and furthermore, the pelvic tilt increased by 13 and 7 degrees from the supine position to the standing position, respectively. This was considered to have increased the risk of anterior dislocation in these patients. Based on these findings, not only the pelvic tilt in the supine position but also that in the standing position should be confirmed prior to surgery for the optimal placement of acetabular cups. To prevent the progression of lumbar kyphosis and the subsequent posterior pelvic tilt, extensive treatment for osteoporosis should be emphasized. In terms of late dislocations, Von Knoch et al. reported that the rate of initial dislocations was 0.19% at 5 years after THA; however, according to a later study, the rate had increased to 0.84%, suggesting increasing incidence of late dislocation [3-27, 28]. This was considered a consequence of the increased durability of the implant and longer life expectancy. We previously reported that late dislocation was significantly associated with recurrent dislocations, which may lead to substantial disability in daily life and sometimes require surgical intervention . Moreover, aging itself is a risk factor for hip dislocation . Thus, extensive care should be paid to the elderly patient with dislocation to avoid recurrence. However, conservative treatment with manual reduction and a brace worked only in Case 3, who had relatively mild posterior pelvic tilt, and not in Case 1 or 2. The use of an elevated liner placed at the anterior portion stopped dislocations in Case 1. However, Case 2 developed a posterior dislocation owing to reduction of cup anteversion, showing the refractory nature of the recurrent dislocation. Hernigou et al. reported the significant reduction of re-dislocation in the patients with constrained liners compared to those without constrained liners in their 7 years-follow-up. Hamadouche et al. reported that a dual mobility cup had provided restoration of hip stability in 96% of patients presenting with recurrent dislocation. Although these specific implants were not available at that time, they could have significant roles in the treatment of these difficult patients to treat. Our case study had several limitations. First, of the 3 cases presented, the pelvic tilt in the standing position could not be determined in case 3, as the necessary radiographs were not available. Second, pelvic tilt was only evaluated using plain radiographs. The OF ratio that correlates with pelvic tilt (r = 0.31) [22-25] was used as an indicator of pelvic tilt. However, if other imaging modalities such as computed tomography had been used, pelvic tilt could have been evaluated in more detail. In this report, we have described 3 patients who developed late anterior dislocations after THA. In elderly patients, it is important to evaluate pelvic tilt using images of different postures before and after THA, and to respond to changes in pelvic tilt that could cause dislocations. This work was supported by a Grant-in-Aid for Scientific Research from the Japan Society for the Promotion of Science (No. 15K10450). 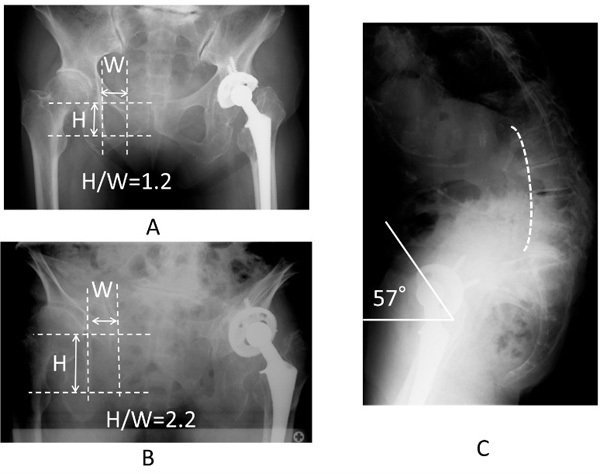 Hedlundh U, Ahnfelt L, Hybbinette CH, Wallinder L, Weckström J, Fredin H. Dislocations and the femoral head size in primary total hip arthroplasty. Clin Orthop Relat Res 1996; (333): 226-33. Bhan S, Eachempati KK, Malhotra R. Primary cementless total hip arthroplasty for bony ankylosis in patients with ankylosing spondylitis. J Arthroplasty 2008; 23(6): 859-66. Woo RY, Morrey BF. Dislocations after total hip arthroplasty. J Bone Joint Surg Am 1982; 64(9): 1295-306. Di Schino M, Baudart F, Zilber S, Poignard A, Allain J. Anterior dislocation of a total hip replacement. Radiographic and CT-scan assessment. Behavior following conservative management. Orthop Traumatol Surg Res 2009; 95(8): 573-8. Dorr LD, Wolf AW, Chandler R, Conaty JP. Classification and treatment of dislocations of total hip arthroplasty. Clin Orthop Relat Res 1983; (173): 151-8. Sariali E, Klouche S, Mamoudy P. Investigation into three dimensional hip anatomy in anterior dislocation after THA. Influence of the position of the hip rotation centre. Clin Biomech (Bristol, Avon) 2012; 27(6): 562-7. Amstutz HC, Lodwig RM, Schurman DJ, Hodgson AG. Range of motion studies for total hip replacements. A comparative study with a new experimental apparatus. Clin Orthop Relat Res 1975; (111): 124-30. Matsushita A, Nakashima Y, Jingushi S, Yamamoto T, Kuraoka A, Iwamoto Y. Effects of the femoral offset and the head size on the safe range of motion in total hip arthroplasty. J Arthroplasty 2009; 24(4): 646-51. Matsushita A, Nakashima Y, Fujii M, Sato T, Iwamoto Y. Modular necks improve the range of hip motion in cases with excessively anteverted or retroverted femurs in THA. Clin Orthop Relat Res 2010; 468(12): 3342-7. Daly PJ, Morrey BF. Operative correction of an unstable total hip arthroplasty. J Bone Joint Surg Am 1992; 74(9): 1334-43. Hedlundh U, Sanzén L, Fredin H. The prognosis and treatment of dislocated total hip arthroplasties with a 22 mm head. J Bone Joint Surg Br 1997; 79(3): 374-8. Digioia AM III, Jaramaz B, Plakseychuk AY, et al. Comparison of a mechanical acetabular alignment guide with computer placement of the socket. J Arthroplasty 2002; 17(3): 359-64. Eddine TA, Migaud H, Chantelot C, Cotten A, Fontaine C, Duquennoy A. Variations of pelvic anteversion in the lying and standing positions: analysis of 24 control subjects and implications for CT measurement of position of a prosthetic cup. Surg Radiol Anat 2001; 23(2): 105-10. Parratte S, Argenson JN. Validation and usefulness of a computer-assisted cup-positioning system in total hip arthroplasty. A prospective, randomized, controlled study. J Bone Joint Surg Am 2007; 89(3): 494-9. Parratte S, Pagnano MW, Coleman-Wood K, Kaufman KR, Berry DJ. The 2008 Frank Stinchfield award: variation in postoperative pelvic tilt may confound the accuracy of hip navigation systems. Clin Orthop Relat Res 2009; 467(1): 43-9. DiGioia AM, Hafez MA, Jaramaz B, Levison TJ, Moody JE. Functional pelvic orientation measured from lateral standing and sitting radiographs. Clin Orthop Relat Res 2006; 453(453): 272-6. Schwab F, Lafage V, Patel A, Farcy JP. Sagittal plane considerations and the pelvis in the adult patient. Spine 2009; 34(17): 1828-33. Tang WM, Chiu KY. Primary total hip arthroplasty in patients with ankylosing spondylitis. J Arthroplasty 2000; 15(1): 52-8. Sato T, Nakashima Y, Matsushita A, Fujii M, Iwamoto Y. Effects of posterior pelvic tilt on anterior instability in total hip arthroplasty: a parametric experimental modeling evaluation. Clin Biomech (Bristol, Avon) 2013; 28(2): 178-81. Lewinnek GE, Lewis JL, Tarr R, Compere CL, Zimmerman JR. Dislocations after total hip-replacement arthroplasties. J Bone Joint Surg Am 1978; 60(2): 217-20. Nishihara S, Sugano N, Nishii T, Ohzono K, Yoshikawa H. Measurements of pelvic flexion angle using three-dimensional computed tomography. Clin Orthop Relat Res 2003; (411): 140-51. Tang WM, Chiu KY, Kwan MF, Ng TP. Sagittal pelvic mal-rotation and positioning of the acetabular component in total hip arthroplasty: Three-dimensional computer model analysis. J Orthop Res 2007; 25(6): 766-71. Tannast M, Murphy SB, Langlotz F, Anderson SE, Siebenrock KA. Estimation of pelvic tilt on anteroposterior X-rays--a comparison of six parameters. Skeletal Radiol 2006; 35(3): 149-55. Tamura S, Takao M, Sakai T, Nishii T, Sugano N. Spinal Factors Influencing Change in Pelvic Sagittal Inclination From Supine Position to Standing Position in Patients Before Total Hip Arthroplasty. J Arthroplasty 2013. Shon WY, Sharma V, Keon OJ, Moon JG, Suh DH. Can pelvic tilting be ignored in total hip arthroplasty? Int J Surg Case Rep 2014; 5(9): 633-6. Meek RM, Allan DB, McPhillips G, Kerr L, Howie CR. Late dislocation after total hip arthroplasty. Clin Med Res 2008; 6(1): 17-23.
 von Knoch M, Berry DJ, Harmsen WS, Morrey BF. Late dislocation after total hip arthroplasty. J Bone Joint Surg Am 2002; 84-A(11): 1949-53. Esposito CI, Gladnick BP, Lee YY, et al. Cup position alone does not predict risk of dislocation after hip arthroplasty. J Arthroplasty 2015; 30(1): 109-13. Itokawa T, Nakashima Y, Yamamoto T, et al. 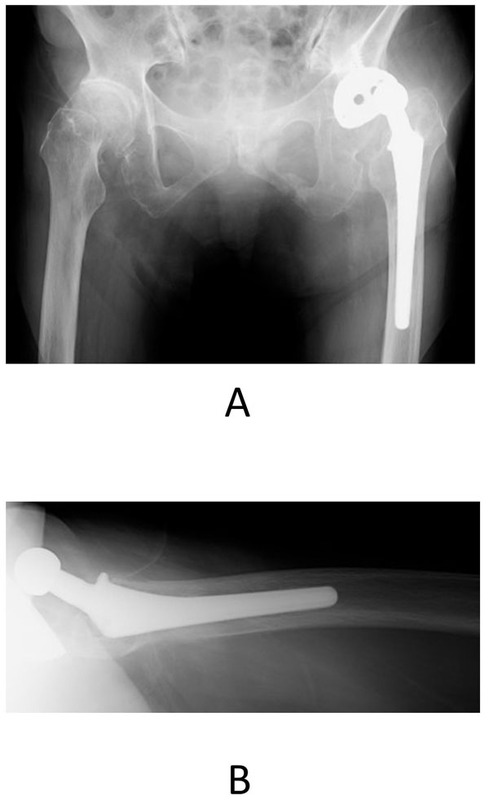 Late dislocation is associated with recurrence after total hip arthroplasty. Int Orthop 2013; 37(8): 1457-63. [SICOT]. Hernigou P, Filippini P, Flouzat-Lachaniette CH, Batista SU, Poignard A. Constrained liner in neurologic or cognitively impaired patients undergoing primary THA. Clin Orthop Relat Res 2010; 468(12): 3255-62. Combes A, Migaud H, Girard J, Duhamel A, Fessy MH. 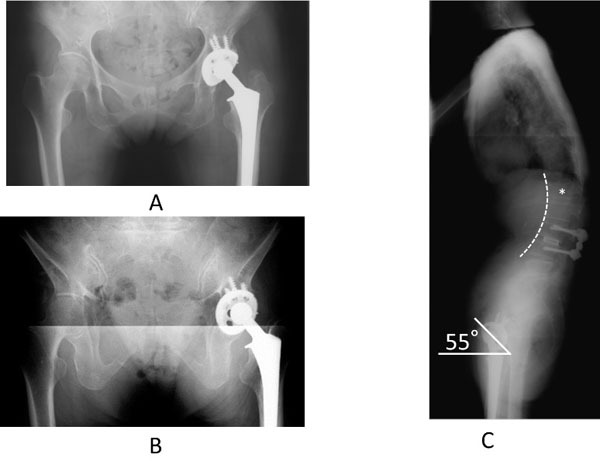 Low rate of dislocation of dual-mobility cups in primary total hip arthroplasty. Clin Orthop Relat Res 2013; 471(12): 3891-900.